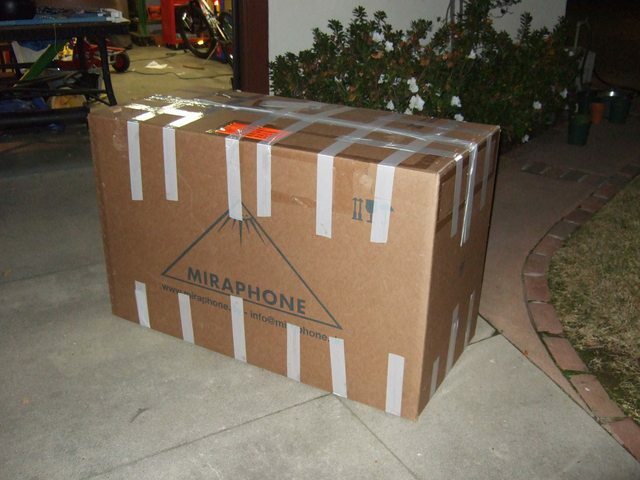 As I was packing my Mirafone Firebird to send to it's new owner it occurred to me that sooner or later most us have deal with shipping a tuba cross country and try to figure out how we can make it less susceptible to damage from the "shipping professionals". 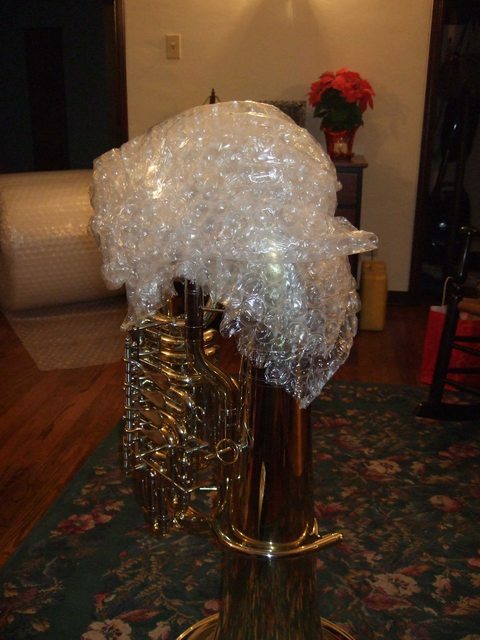 I have been lucky for the most part receiving instruments in good condition but on two occasions the tubas arrived damaged due to improper packing. I also have to fess up: once I listened to bad advice from the FedEx counter guy and he did not add extra packing materials like he promised and the mouthpieces I sent were damaged (sorry Jay and Morris ). The moral of the story, pack the box yourself, use the proper materials, and don't rush or take short cuts. A small beach ball to put in the bell. It cushions the bell and helps spread out the shock in case the box is dropped. It may be wise to have a helper on hand. 1. 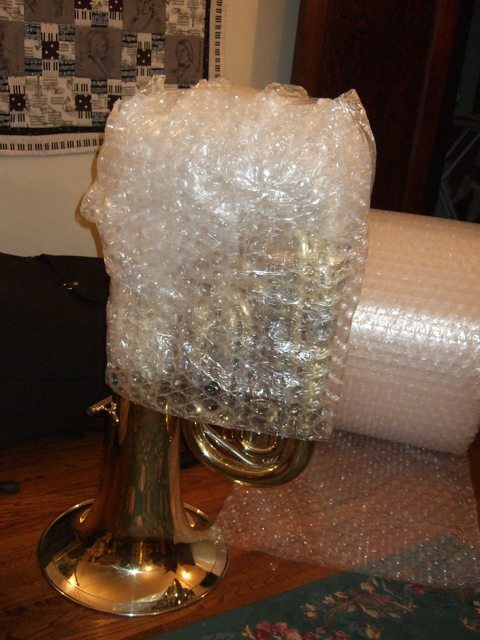 Wrap the tuba in lots of bubble wrap and tape (did I mention to buy lots of tape), don't be stingy! I started at the bottom and made a cushion for the bottom bow. The last picture shows the wrapped Firebird next to my Yamaha YFB822. 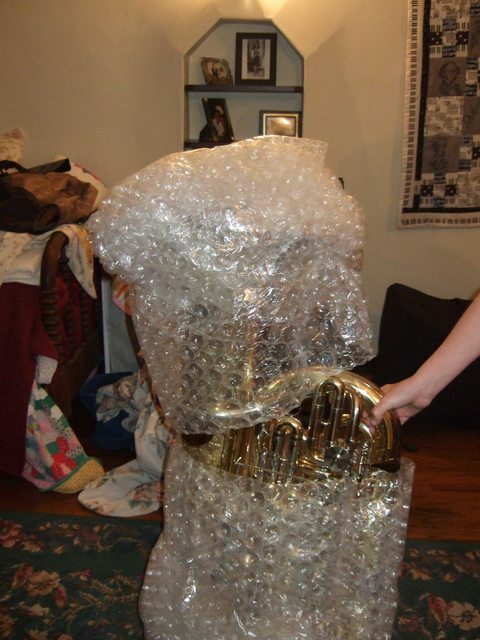 There is a lot of bubble wrap on that tuba! Last edited by Norm Pearson on Thu Aug 24, 2017 1:19 am, edited 6 times in total. The box I used is from Mirafone but you should be able to buy a suitable box at a shipping store. Don't be stingy on a box that is holding a $$$$$ musical instrument. The box I used measures 48' X 22" 30"
5. 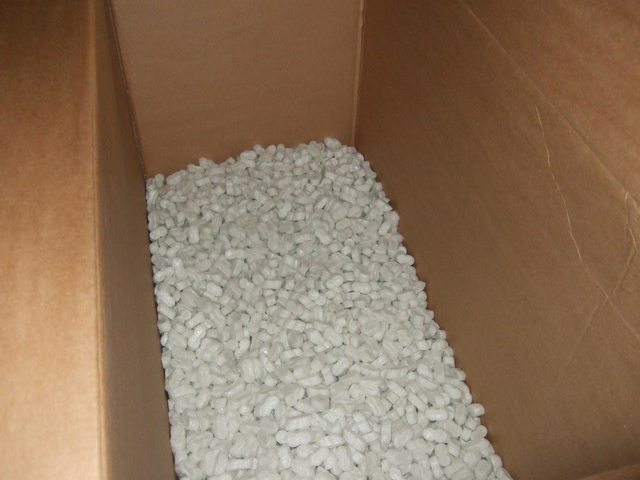 Add a layer of packing peanuts to the bottom of the box approx 6" deep. 6. Put a piece of cardboard over the layer of peanuts. This helps to keep the tuba from working it's way to the side of the box. This was a great piece of advice I got from Steve Ferguson. 7. Lay the tuba in the box and put a piece of cardboard on each end. 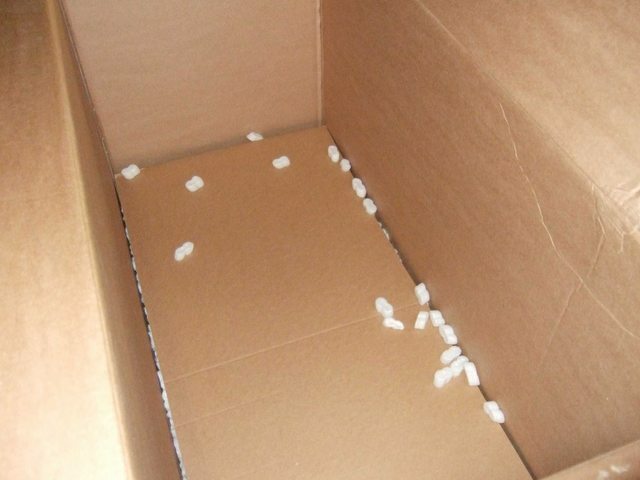 Pack some peanuts between the cardboard and the end of the box. This will also help keep the tuba in the middle of the box. 8. Fill the box to the top and push the peanuts all around the tuba. I used a very large bag. If you can find large air filled packing pillows buy them instead of the peanuts. 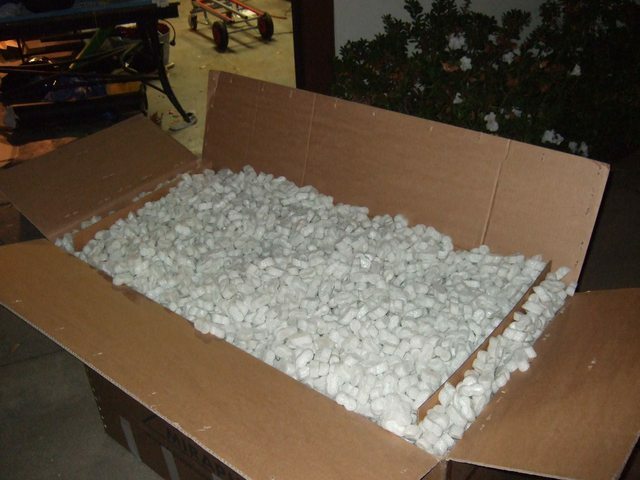 Packing peanuts are a mess when you try to dispose of them. The pillows can be cut up with a utility knife and put into a recycle bin. 9. Tape the box with strapping tape. I am not an expert but I thought that others would be able to learn from my experience. By all means if anyone sees something I overlooked or has a better idea, chime in. Last edited by Norm Pearson on Thu Aug 24, 2017 1:18 am, edited 3 times in total. 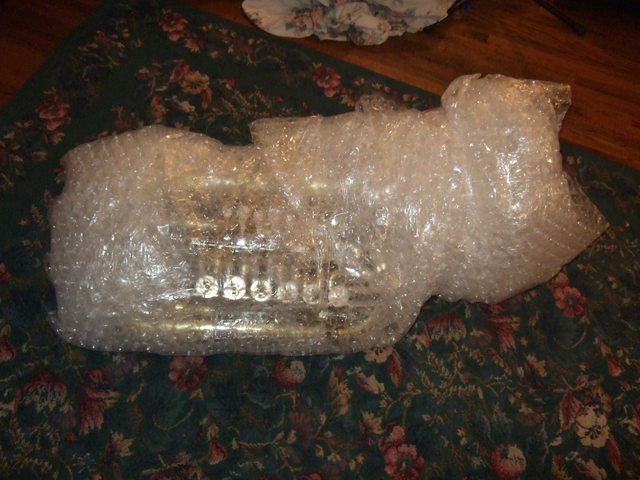 When I recieved my tuba (from WWBW) it was inside of my hardcase (i know it is different). Around my tuba were strips of the air "pillows" they were squares about 6"x5" bubble wrap. I enjoyed the ease of disposal that these allowed rather than a million penuts. I got a Humes and Berg straight mute (aluminum) from Baltimore brass that had these pillows all around it and it was full (the mute) of penuts, those little things just kept coming out for a solid 5 minutes. It was humerous to say the least. Both the mute and tuba were shipped in double walled cardboard boxes, both faired very well. The only scary part was when I picked up my tuba at the freight depot. The tuba (in Box) was strapped to a pallet and had to be fork lifted into the bed of my truck, the operator missed the pallet on one side and the fork went under the box shaving the first layer of the double walled box off. No damage though luckily. tubatom91 wrote: Around my tuba were strips of the air "pillows" they were squares about 6"x5" bubble wrap. I enjoyed the ease of disposal that these allowed rather than a million penuts.........it was full (the mute) of penuts, those little things just kept coming out for a solid 5 minutes. It was humerous to say the least. Hey Norm !!! I swear by that warm up routine you laid on me! What a difference! ztuba or Norm: care to elaborate on the warmup routine? Those pictures and comments will likely save some people some heartache and money. I have an area (overhead - about twelve feet off the floor) that is 20' x 8' x 6' tall for cartons and packing material - stuff that I save to re-use. Other than large-bubble bubble-wrap, the material that I "treasure" the most is those long strings of clear plastic inflated "packing pillows". Bit-by-bit, I'm trying to get away from styrofoam peanuts. I'm no "green freak", but I hate unnecessary (often non-biodegradable) messes...and peanuts (no matter how much one tries to restrict their movement) tend to escape and go everywhere. 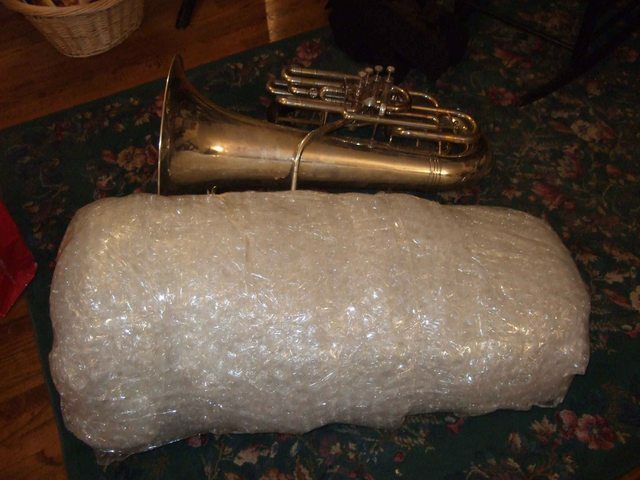 Once I've mummified a tuba (as Norm pictured above...and so that, probably, it could - on its own - survive at least a 2' drop...or a pretty good fist-punch) I try to use packing PILLOWS (rather than packing peanuts) when packing large instruments such as tubas and sousaphones. I realize that these are not as accessible to most people...You just about have to own a machine that makes these. (I don't own a machine...I just SAVE them.) Finally, the PILLOWS save about 5 minutes of packing time *and* (almost always) about 10 *more* minutes of clean-up time. A final tip (particularly if you have to purchase your tape at over-priced places like Walgreens, etc. - Clear tape only has any *real* strength when spanning closures of flaps. Clear tape should only run "co-linear" with closure seams. - Strapping tape (with embedded fibers) is the only type of tape that can substitute for string or rope. If you are running tape at 90 degree angles to closure seams, you are wasting tape (and effort) unless you use strapping tape for this purpose. Thank you for the pictures Mr. Pearson. They are very informative. I work for Fedex and I can tell you that while I have shipped instruments with Fedex Ground a hundred times and never had a report of damage, it is wise to "overpack" them. Assume they are going to be sat on by a 250 lb. person or dropped from a height of 10 feet. As careful as I am I have seen one box roll over and crush another on my truck. A new, crisp, heavy box is always better than a used BBQ grill box. I might also suggest the heavy cardboard L shaped reinforcement strips that sometimes come in boxes. They are ideal for cutting to length and tapeing or glueing inside the corners of the box and across the top and bottom. Thanks for the ideas! I especially like the idea of using cardboard in the box as a buffer to prevent a horn from settling to one side. My solution is to own a Walt Johnson case and have the case shipped back to me once the horn arrives. I always use the ball in the bell idea though. The one time I didn't bad things happened. I've only ever used Amtrak or Greyhound for shipping tuba sized items. Always had good luck. I thought the conventional wisdom said you should stay away from UPS and FedEx for tubas. Does this conventional wisdom still hold true? 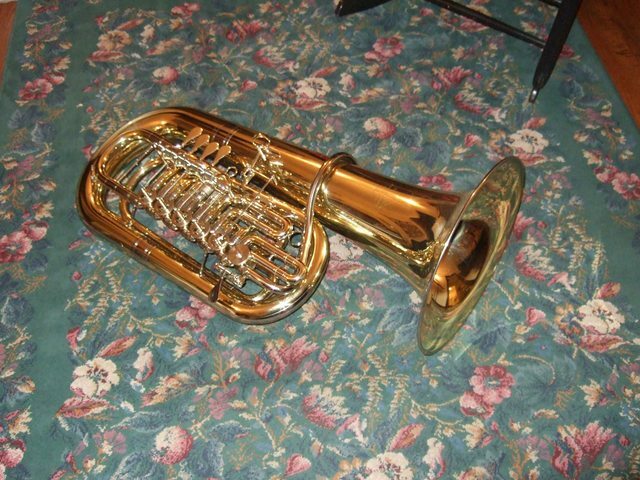 I once had a tuba shipped to me from BBC via DHL. That seemed to work out nicely but they packed it to resist a nuclear bomb too. MANY years ago Custom shipped me a PT6 in the cheap wood shell case via airline freight shipping. I think after 9/11 they stopped using that method because of changes in security rules. That method scared me to death. What an awful idea. Thankfully the horn was fine. The extra cardboard to prevent settling is a great tip. I'll do that in the future. 1) My outermost layer on the horn (over the bubble-wrap) is a couple of large garbage bags, so the un-bubble-wrapping doesn't include static-y cling-on peanuts - those stay with the garbage bags, that are easily slipped off. 2) Call me paranoid, but I throw into the box a piece of paper with the destination name/address and my return address. I tape-over the outer shipping address label with clear packing tape to buffer it from scraping and water-staining, and I ship with sufficient insurance, but nevertheless, I feel better having the backup info inside the box. Also, my last horn I lacked a large-enough box, so I over-lapped two smaller, more obtainable (but still large) boxes together. No problems with the result. I've since received two euphoniums packed and shipped by UPS that also used two taped-together boxes. I forgot to mention this in my previous post, there was ONE packing peanut in the bottom of the box . I just received a tuba shipped to me by Jeff Rideout, and he used peanuts, but put them in ziplock plastic bags. That's the best way to use peanuts I've seen in a long time. No peanuts escaped into the home environment. The tuba itself was in a plastic bag, same as the manufacturers use. It's a lot better than the first tuba I had shipped from that store in Detroit, maybe 25 years ago, which was packed in straw in a wood crate. But I have decided that just about the cheapest packing material and perhaps the best is new, rolled paper towel. I go to Costco and buy several of the big 18-packs. I leave the individual rolls in their plastic wrappers, which provide an air cushion as well as the paper cushion. The advantage of the paper cushion is that it damps shock beautifully. They can be used in lieu of the beach ball, and you can achieve the double-boxed effect without the sheets of cardboard. 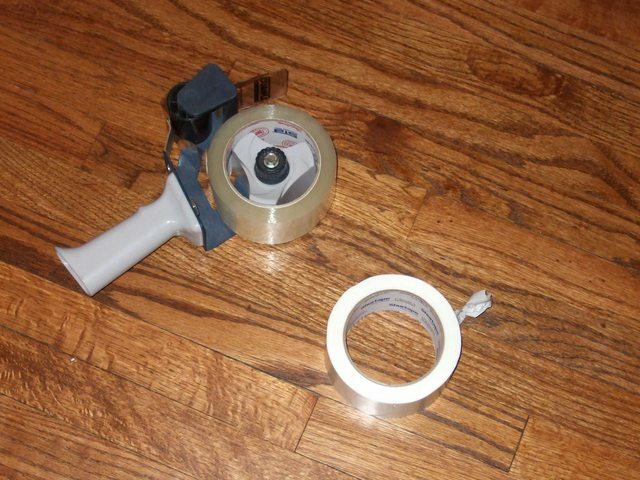 I put the tuba in a plastic bag, and then tape the rolls to the outer branches to center the instrument in the carton. No need to fill every air space--the rolls won't leak into other parts of the box. And there is no waste. Everyone can use a stock of paper towels. I once received a tuba that was shipped bell-down, with no beach ball. You can imagine the result. I still don't know if the sender packed it that way or if the shipper put the label on upside down and it got shipped that way by accident. Either way...the packing should have taken that possibility into consideration, like the fine example shown in this thread. Things like this, without the replies to topic, would be great to have in an FAQ section for easy reference. When I ship horns, I like to use hot glue to fasten the bottom inside flaps down so the peanuts don't get under and weaken the box. Also a couple of pieces of masking tape over the receiver keeps anything out of the leadpipe. Everything else said previously is very good. That exact same beach ball was in the bell of my Miraphone 184 when Ferguson Music shipped it to me. 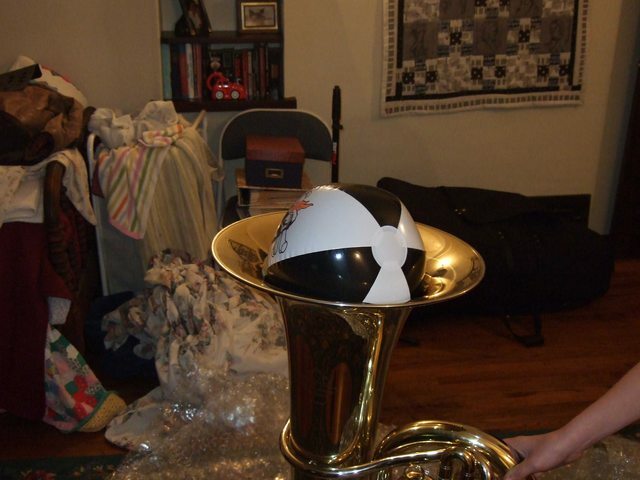 Is the pirate beach ball an industry standard for shipping tubas? Last edited by Homerun on Sun Jan 30, 2011 4:23 pm, edited 1 time in total. Sorry about the missing pictures: my Photobucket account went away so I had to open a new one. 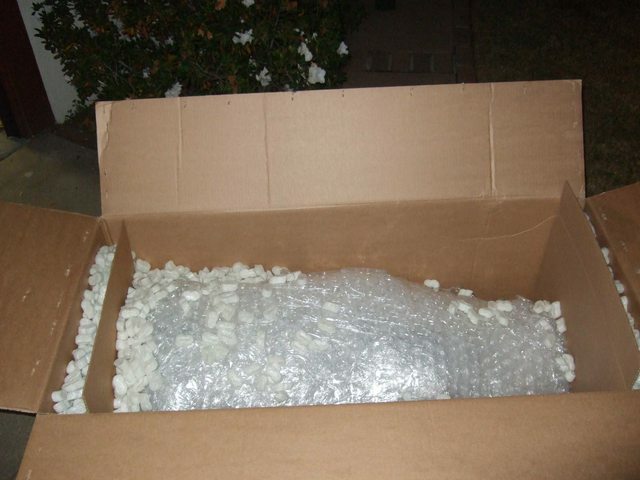 Feel free to add to this post if you have any better ideas on packing tubas for shipping. Last edited by Norm Pearson on Sun Jan 30, 2011 2:58 am, edited 1 time in total. Also liked the repeated statement that not all libertarians are against all consequences of inflation. 1. Using strapping tape with string embedded in it, tape every seam on the outside of the box. 2. Using recycled cardboard of the correct dimensions, cut slits in several pieces and create a grid with nine empty spaces and place it on the bottom of the box. 3. Using strapping tape, tape every edge of the grid to either the floor or side walls of the box. 4. Take nine plastic shopping bags and fill them with plastic peanuts. 5. Place one bag in each of the empty space in the grid at the bottom of the box. 6. Using a piece of recycled cardboard cut to the proper width and length, place this on top of the bags of plastic peanuts. 7. Using bubble wrap and tape, make a u shaped cushion to fit over, under, and around the bottom bow of the horn. 8. Place an inflated beach ball in the bell of the horn. 9. 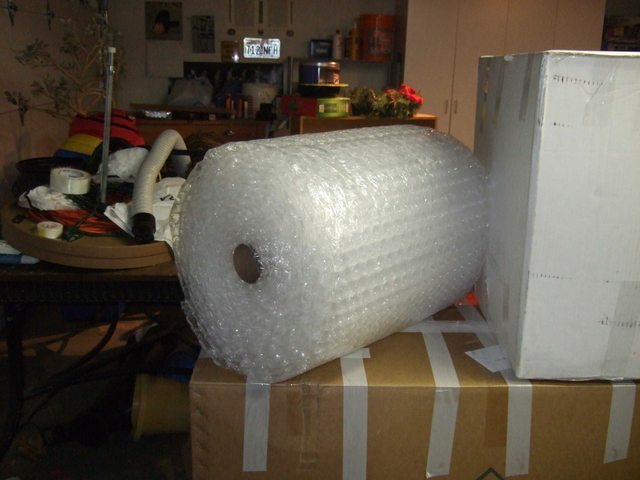 Wrap the ball securely with bubble wrap and tape to the horn. 10. 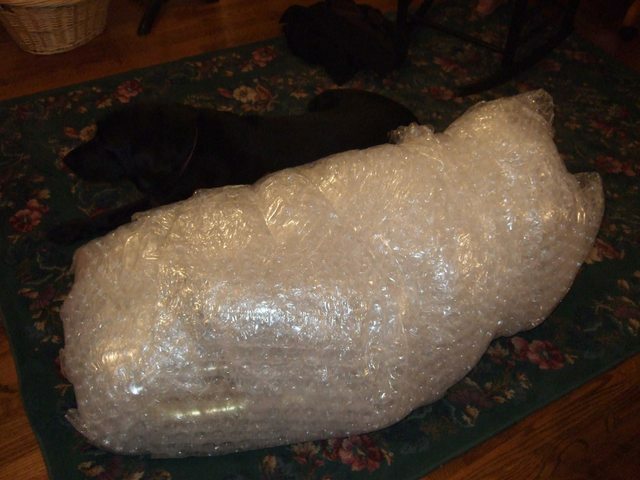 Starting at the bottom of the horn and moving to and including the top, mummify the horn in bubble wrap. 11. Place the horn on its side inside the box. 12.Using Jumbo paper towels, fill every available space. Especially at both ends of the box. When done the horn will be under at least two layers of towels. 13. Seal the box using strapping tape. 14. Address correctly including phone numbers. 16. Have a really big drink, you"ll need it!